Anyone who has bought plastic party tablecloths knows they are often printed only on the sides and completely white on top where they are most visible. This tablecloth has fish and bubbles printed on the top, making it much more festive. Best of all, the sharks are cartoon so not too scary, but still a little scary, because isn’t that the point? This pattern is available in matching plates, cups, napkins and treat bags making it great for parties. This tablecloth is solid blue, which is nice. The sides are printed with waves and shark fins. It is perfect for an outdoor party, especially a pool party. These cups come in a set of 12 and are always a big hit. They make great party favors, or drink cups when setting the table for a shark-themed party. If you want to use them for every day, just keep as many as you need and give the rest away as cute add-on gifts for all the shark lovers in your life. Set includes 8 – 9oz cups which are great for serving drinks, ice cream or small snacks. This pattern is available in matching plates, napkins, treat bags and tablecloths making it great for parties. Perfect for a shark-themed birthday party, a Sharknado party or a Shark Week celebration. Best of all, the sharks are cartoon so not too scary, but still a little scary, because isn’t that the point? 16 matching napkins to add additional flare to your occasion. This pattern is available in matching cups, plates, treat bags and tablecloths making it great for parties. Perfect for a shark-themed birthday party, a Sharknado party or a Shark Week celebration. Best of all, the sharks are cartoon so not too scary, but still a little scary, because isn’t that the point? Also comes in 16 count. This pattern is a little more menacing than the cartoon shark pattern. Perfect for a party where you are going for a “scarier” feel. Package of 8 plates, each measuring just under 9”. This pattern is available in matching cups, napkins, treat bags and tablecloths making it great for parties. Perfect for a shark-themed birthday party, a Sharknado party or a Shark Week celebration. Best of all, the sharks are cartoon so not too scary, but still a little scary, because isn’t that the point? This poster measures 40” x 50”. It offers a photo opportunity for party guests to take a picture with their head in a shark’s mouth. It can be used indoors by hanging in an open doorway. Adults and kids alike enjoyed taking pictures with it. We printed out copies and sent them with our Thank You cards for a fun keepsake. 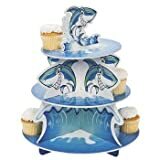 This three-tiered pastry stand makes a great centerpiece for your food table. Can hold 24 cupcakes. Also looks great with clear cups of blue Jello containing gummy sharks. Made of paper-covered foam, it features several “scary” looking sharks. These 5” tall boxes come in a pack of 12. They look great and are a big hit with kids, but they are a bit on the small side, so choose smaller treats. Well worth the price and they look great on the table! These goodie bags come in a set of 8. They are 9” x 7” a nd will hold a fair amount of treats. This pattern is available in matching cups, plates, napkins and tablecloths making it great for parties. Perfect for a shark-themed birthday party, a Sharknado party or a Shark Week celebraion. Best of all, the sharks are cartoon so not too scary, but still a little scary, because isn’t that the point? These five hanging sharks will be the hit of your party. The boys wanted them hung in their bedroom afterwards so they can continue to enjoy them. Different types of sharks on each whirl. Also a hit at Sharknado parties and Shark Week celebrations. These come in various colors and are between 32 and 36 inches (about 3 feet). This banner is the bomb. It is 8’ long by 7” high, brightly colored and attractive. The real hit with the kids was the fact that each letter has at least one bite taken out of it by a shark. Made of light cardboard, it is durable enough to withstand the rowdiest of party guests. These three hanging decorations will be a hit at any shark-themed party. The sign has a shark fin on top and a bite taken out of the bottom. This same design is available in napkins, a poster and a giant banner. Comes in a 3-pack. You can buy these as party decorations, but you will end up keeping them as toys. The kids loved bopping one another and sword fighting with these cute inflatables. You get a set of three, one each of red, white and blue. They are 24” long and great for pool parties. The perfect beginning to your shark themed event – greet your guest with this scary shark door cover. It was such a hit the boys wanted to keep it on their bedroom door. It always feels better to spend money on party supplies when you know they will have a life after the party. Size is 30in wide by 60in long.